A Filipino short story, like any other form of literature, has evolved like the country’s history. There are a good number of Philippine short stories published in magazines, books, anthologies and even on the internet. Short stories by Filipino writers showcase the Filipinos’ talent as a story teller and as a writer. Philippine short stories have always been the country’s most popular and well-liked literary genre. They discuss a wide array of themes which varies from political to nationalist to present day social issues. Prior to the country’s colonization, Filipinos already have their own short stories through their myths, legends, fables and folktales. Each region has its distinct form of storytelling and this made up the variety of Philippine short stories. During the American regime in the Philippines, the country developed a distinct form of short story. Short stories by Filipino writers were found in weekly magazines in various local dialects like: the Tagalog’s Liwayway, the Illongo’s Hiligaynon, the Cebuano’s Bisaya and the Iloko’s Bannawag. The short story written by Paz Marquez-Benitez entitled "Dead Stars" is said to be the first major short story in English. The early 20th century also ushered in the writing talent of short story writers like: Jose Garcia Villa, Paz Latorena, Arturo B. Rotor and Loreto Paras- Sulit. Most of these writers work on the love and romance themed short stories to the likings of many Filipinos. As the country’s history evolved, other short story writers also broadened the themes of their short stories ranging from social problems to nationalism to the Catholic and Mohammedan traditions to modern influences. Nick Joaquin, F. Sionil Jose, N.V.M. Gonzales and Manuel E. Arguilla are the forerunner of short story writers which deals with the aforementioned themes. The vernacular Filipino short story also thrived at the same time with its English counterparts. Writers like Lope K. Santos, Patricio Mariano and Valeriano Hernandez Peña showed aptitude in the genre which is akin to the dali or pasingaw, an early Tagalog short fiction. Additionally, writers like Gilda Cordero-Fernando, Gregorio Brillantes, Juan T. Gatbonton, Romy Diaz, Edilberto and Edith Tiempo, Kerima Polotan Tuvera, Maximo Ramos and Wilfrido Nolledo wrote short stories infused with local backdrop. Students and short stories enthusiasts will be delighted to know that a compilation of the best short stories of the 20th century is now available for their reading pleasure. A compilation of these beautifully written short stories was launched in 2000 and it featured 50 of the most brilliant short story writers of the 20th century. The list includes: Paz Latorena, "Desire"; Loreto Paras Sulit, "The Bolo"; Arturo B. Rotor, "Zita"; Manuel E. Arguilla, "How My Brother Leon Brought Home a Wife." 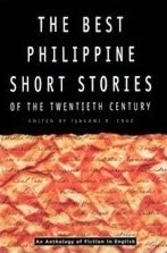 Additionally, the works of Cristina Pantoja-Hidalgo, Alfred Yuson, Jaime An Lim, Jessica Zafra and Cirilio Bautista among others appear in the anthology entitled "The Best Philippine Short Stories of the 20th Century." The book is a gem for any Filipino short story enthusiast.